If you have an aging DVD movie or CDs that hasn't been touched for years but suddenly you want to watch it on your iPad or iPhone on the go, but you simply can't. The only reason is unsupported AVI format that iTunes is unable to sync via media. It also happens with some other file formats as well, but all you need to do is use the software that I'm going to review today, and directly convert it into a portable media file format. Not only for mobile devices, but the application also provides you with an extensive list of devices you can save the file to play on. The iSkysoft iMedia Converter Deluxe for Windows offers is an ultimate DVD, and Video solution as the software offers a powerful media platform to convert your videos and audio files into suitable file formats and vice-versa. Thus, becoming the all in one tool for all your media conversion needs. It can be used to convert DVD and videos, downloading, editing and burning, recording of videos, and much more efficiently and with this high speed and performance oriented software. It is without any doubt a premium tool, but the company offers a free trial version of the software to get the glimpse of all the features that you can get entertained from. iMedia software offers some video editing features apart from the standard media conversion options that I would mention later in the review. Let's say; you have a piece of lengthy uncut footage that need to trim and alter before converting it to another format. The iMedia Converter allows you to do the necessary editing by selecting the portion of the video that you want and trim the unwanted part. Apart from this, you can also crop the images and adjust basic video properties like brightness, contrast and saturation without any efforts. Wait, there's more, the software also features some filters, adding watermarks and even subtitles like advanced options but If you want more than this, you'll need to purchase video editing software instead. 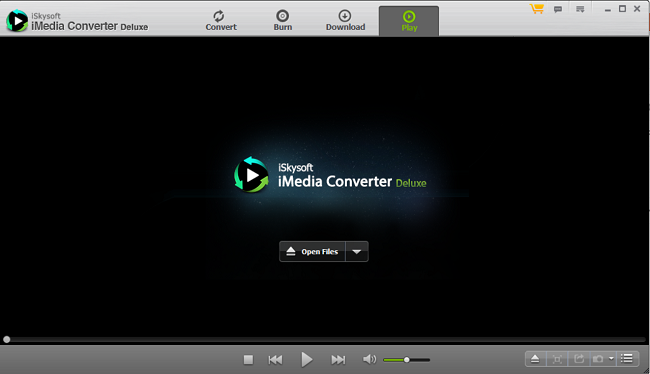 One of the handy additional features of iMedia Converter is its ability to download videos from the internet. It just works like other dedicated programs such as KeepVid or YTD. You just need the URL of the video that you want to download. Directly paste it into the downloader, and you'll have your video downloaded into the hard drive, ready to be edited or conversion. The software isn't a premium one for just media conversion process. So, once you've successfully downloaded the video or you have any modified or converted media, the iSkysoft Media Converter software also lets you burn them onto a DVD. This rudimentary feature is pretty useful and simple to access. Just drag the file you want to burn your DVD, and select the template from Burner's menu. There aren't many customization options available, but there doesn't need to be. The output media is supported by almost every DVD player without any hassles. Primarily, the main function of this program is to convert videos from one format to another, and it does the job perfectly. Moreover, taking the file conversion to another level, this application allows you to create custom videos for iOS and other portable devices. It often comes handy when you need to transfer media onto your smartphone, Tablets, and gaming consoles. All in All, the iMedia Converter alone does most of the job of multiple software programs. Consider purchasing this tool, and you wouldn’t need any DVD burner, video downloading software, basic Video Editor and of course, a Media Converter. 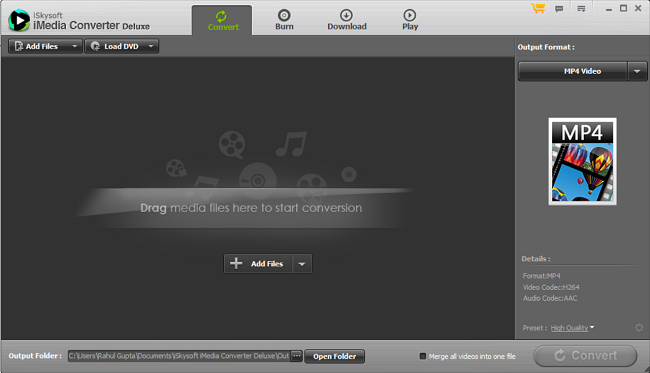 Easy video editing with iMedia Converter. You are entitled to Trim, Add Watermark and Subtitles, Crop, Rotate, Volume, etc. also, you can merge multiple videos into one and convert it later. iSkysoft makes it easy to take screenshots of the current video clip which is under conversion, playing, or for editing. You can save them in BMP and JPEG supported formats and use it later for multiple purposes. You can also play various DVD formats you want to convert accordingly. While using this software, I also found that the software is capable of detecting the current media automatically, and you can record it with the inbuilt video recording tool. You can also convert media files to DVD disc image, backup your DVDs or convert them and save them to the cloud. Compiled with turbo GPU Acceleration and the presence of Intel chip, the software works like a charm. It promises to deliver more speed and a 100% Lossless Quality with preserving your original media quality and leaving the encoding unchanged. Convert DVD, Audio and Video Media for personal usage. Easily Download and Record Media from the Internet. Usage of the inbuilt editing tools to customize your videos. Inbuilt DVD burner feature available. The iMedia Converter application ran smoothly on the MAC OS and was working correctly on Windows 10,8.1,8,7, Vista and other versions too. Regarding the media, the software seamlessly works with MP4, MPG, MPEG and other 158 supported file formats. You can purchase the software directly from the iSkysoft website for a discounted price of $49.95. The one thing that decides the growth of a company is the after sales service, and iSkysoft offers a broad range of options for both customer and technical support. If you face any kind of issues regarding the conversion tool or any questions about the software, you can first search and browse a wide FAQs section which mostly covers your doubts. You can then contact the team via email or live chat option. Unfortunately, there's no phone support available. So, this was the review of iSkysoft's very own iMedia Converter. The software is compatible with iTunes, and video editing tools like Final Cut Pro and iMovie. Moreover, you can also use this software to download different videos from the internet, edit them, and simply convert them to various supported formats for your iPads, iPods and other devices. The DVD burner is like the cherry on top and works fairly great. Do share your thoughts and let me know if you're using this tool for your everyday media related purposes. Cheers!